Q: What is the penalty for failure to comply with extended producer responsibility (EPR) and have EPR laws increased sales of rechargeable batteries? Carl Smith: The specific requirements of EPR and the penalties that may be involved vary tremendously from jurisdiction to jurisdiction; however, the bigger issue with many companies is how non-compliance may tarnish their brands. Many major companies worry more about the image of their brands than about nominal financial penalties. Also, the amount of penalties imposed is often irrelevant since there is very little enforcement of EPR laws throughout the United States. I am not aware of any penalties imposed on consumer battery brands in the US for non-compliance with product stewardship requirements. Q: What is done in states that are not governed by mandated extended producer responsibility laws (EPR)? Carl Smith: Regarding batteries, the majority of states are not governed by mandated extended producer responsibility laws. In these states, consumers either take advantage of our voluntary program or they dispose of batteries in the normal waste stream, often ending up in landfills. 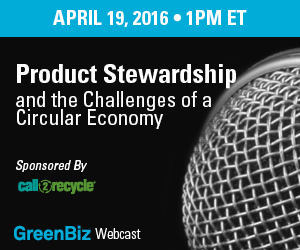 Q: Can you clarify what the difference between product stewardship and EPR is? Carl Smith: While both terms are used interchangeably, there is a significant difference. “Product stewardship” refers to managing the environmental impact of a product throughout the product’s lifecycle, from securing raw materials for manufacturing to the product’s ultimate disposal at end-of-life. Extended producer responsibility (EPR) is a concept often adopted as public policy where a brand owner of a product is obligated to design, finance and operate a recycling program for that product at its end-of-life. Q: Do you think we can get to a circular economy with single stream recovery or do we need to separate even better than what the current system allows? Carl Smith: A big downfall to single stream recycling is that many of today’s systems do not provide for the efficient identification and separation of the various materials that are to be recycled, causing much of the material to be contaminated. This makes its financial viability very challenging. While this approach to collection is less costly and more user friendly, single stream recovery inherently limits the ability to use what is collected in secondary products. Q: What opportunities exist to change what is happening at the landfills in relation to urban mining, biocompatibility / earth-friendly degradation, make compatible with single stream recycling processes? Carl Smith: While some companies have experimented with bio degradable materials for the manufacturing of batteries, these have not proven to be of sufficient quality to be largely commercialized. In the end, batteries will be required to be constructed largely by metals which can only be recovered through urban mining. Q: Can you offer specific language that government could take away today to insert into battery legislation? Carl Smith: The battery industry has developed a set of principles around which any mandatory EPR legislation should be written. The National Electrical Manufacturer Association (NEMA), in particular, has information available (link to: http://www.nema.org/About/pages/default.aspx) regarding the principles of battery legislation that can serve as guidance. Q: What about industry coalitions to demonstrate commitment to suppliers? Stewardship organizations like Call2Recycle, Inc., are groups of companies working as a coalition that are intended to leverage resources and create economies of scale when responding to legislation. Q: Can you recommend a comprehensive examination of the evolution and effectiveness of legislated EPR vs. voluntary programs? How about prioritizing above recycling? Carl Smith: There is a fairly extensive research paper by Garth Hickle, from the state of Minnesota’s Pollution Control Agency. Mr. Hickle did an extensive evaluation of product stewardship, EPR and the various options and how well they work or they don’t. For more information please visit: (link here to material by G.Hickle hosted on our website). Q: What is the most cost effective way to recycle primary (single-use) batteries? Carl Smith: The most effective way to handle primary battery recycling is to ship a full truck load of batteries in bulk directly to processors and to ensure that there are only alkaline (single stream) in that shipment. If lithium primary batteries are mixed in for sorting and processing, it will increase the costs significantly. Q: Can you state a few good and bad examples of circular economy in action, in US / Canada? Betsy Dorn: A couple of good examples of government programs that have been put in place which follow the principles of a circular economy are the City of Phoenix, which is revamping their system to align with circular economy principles, and their partnership with the University of Arizona. They are looking at stimulating innovation to identify new ways to divert materials from disposal via resource recovery. This is an example of a partnership between the public and private organizations that could bring solutions that can inspire others. Q: How do you incentivize reuse and use of recycled materials when used is considered less desirable? Betsy Dorn: One of the things that we need to do is raise the cost of waste disposal. If disposal is expensive, recycling has an easier time of being cheaper. As stated previously, we should incentivize recycling so that we make it as easy as possible for consumers to recycle. We should also be looking at policy mechanisms for materials that have high demand such as banning the disposal of such materials. Another option can be to establish variable rate user fee systems, where waste generators pay for waste collection and disposal in accordance with how much waste they generate, and can recycle materials with no additional payment required. Such “Pay as You Throw” systems provide a financial incentive for recycling. 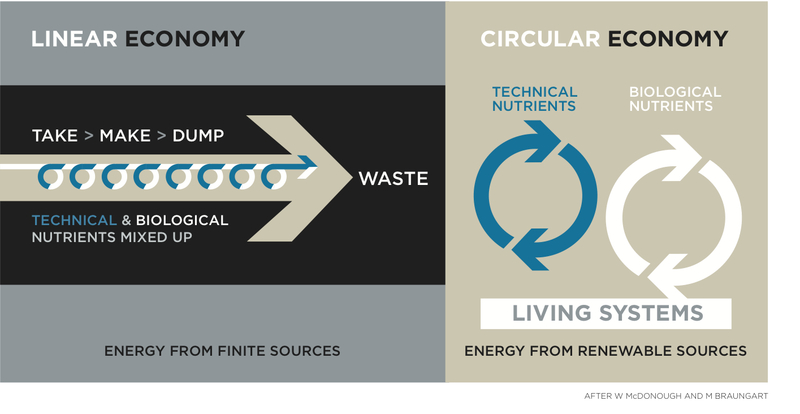 Q: What are three major things that should happen so the circular economy becomes mainstream? Betsy Dorn: Getting communities across the board to have food waste recovery systems, is a good example of something that would make a difference if coordinated at a central level. Focus on food waste reduction is going to be critical to having a healthy economy. Secondly, government and industry should take part in recognizing these matters as a business development issue. It is a challenge that requires a different talent to help find solutions. It’s a job of entrepreneurs, and academia that requires a different type of engagement in terms of disciplines, and not only from talent at the waste management level. Thirdly, we also need to evaluate the existing supply infrastructure. In the current system, we hope that these materials become available but sometimes the brand owner of a product is not playing much of a role in capturing materials at end of life so that they are kept in the supply stream. Therefore we have to provide a better linkage between the supply system and waste management organizations. This might require a new approach from municipalities as well as industry that can address these challenges in a different way. Q: Can you have only a part of the economy being circular while the rest of it is linear? Betsy Dorn: It should not be an “all or nothing” option and the whole process will take time to be completed. Before there is a complete implementation of the circular economy principles, part of the economy might remain linear for a long time. Some materials get degraded and cannot be recycled over and over again. There will be a need for some additional sources of supply beyond recovered materials. Q: What kind of technology solutions does the circular economy need to make it work? Betsy Dorn: In order for the circular economy principles to work we should invest on research development, especially for material recovery facilities. One of the ways that we can do that is by addressing smaller material packages, for example: coffee pods, cosmetic packaging, etc. These are not managed well in the current system. There are opportunities to come up with equipment that can handle sorting such materials more effectively. For too many products, due to its size or materials that go into them, we don’t have a real way to recover them.